I've been raving about this mascara in just about every post these last couple of months so I thought it was about time I gave it it's own review. 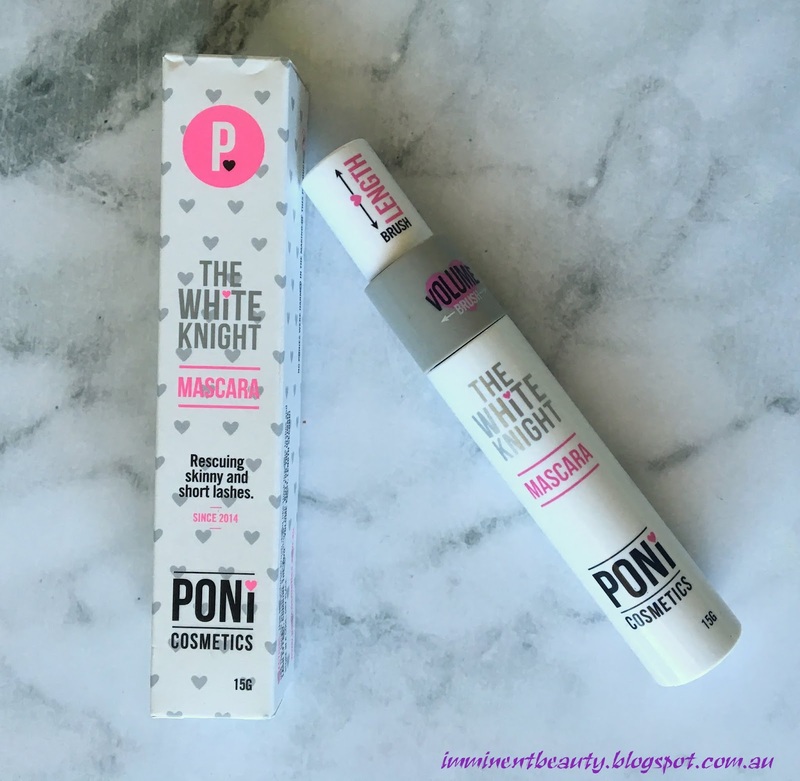 The Poni Cosmetics White Knight mascara became my new holy grail mascara the very first time I used it. It's the very first tubular mascara I've ever tried and when it came with Zoe Foster Blake's endorsement... well that was the only encouragement I needed to give it a try. "It truly is the ultimate mascara! This tubular mascara has a list of features and benefits as long as your arm. No Panda eyes ever - guaranteed, Water resistant, doesn't run, smudge or transfer onto the skin, even in humid weather, great for sensitive eyes, simply slides off using just water in the shower, build able and safe to use with lash extensions, contains 3 powerful growth ingredients and has a dual functioning brush - volume and length. The perfect mascara for any one, of any age." For those of you who don't know about tubular mascara, they're not too much different to regular mascaras in their application and look but on the lash they kind of wrap around each lash individually like a tube. You can't really tell when you're applying it - in fact the only way I can tell is when I'm removing it. This is the easiest mascara in the world to remove as it doesn't require any special cleanser just some warm water and swipe away. You'll see the mascara come off in little tubes or lines on your makeup pad. The White Knight mascara is in your basic mascara packaging but the brush is actually two brushes in one. You have two choices Volume or Length - they're the exact same brush except when you unscrew the wand from the top (Length) end it scrapes off excess product similar to wringing out a mop. When you unscrew from the volume end it leaves that excess product on hence giving you more product and more volume. The White Knight mascara gives me length, curl and volume all in one tube. It applies easily and removes like a dream. But the very best part of this mascara and why I love it so so much is that IT DOESN'T SMUDGE. EVER. In hot weather, cold weather, rainy weather, gone are the days of panda eyes and my mascara dotting under my eyebrows when I look up. there's also a factorie mascara, tubular too, which retails for $10 (but always sold out :( it curls my lashes better than poni! I love this! The lack of smudging is something that I absolutely adore about this mascara! Ohhh I'll have to get this!!! Sounds awesome.